In family court disputes concerning child support, alimony and other aspects of divorce, both parties will be required to submit a sworn affidavit detailing all aspects of their finances. This Form JD-FM-6 is listed on the website maintained by Connecticut's Judicial Department. Connecticut Financial Affidavit JD-FM-6 Step 1: Enter your name where indicated, along with the judicial district in which the case is being heard, the court address, the name of the case, your job and your employer's name and address. Connecticut Financial Affidavit JD-FM-6 Step 2: Section one, "Weekly income," asks you to detail your income. If the amount you earn varies from week to week, provide averages based on your income from a period of 13 weeks or greater. Connecticut Financial Affidavit JD-FM-6 Step 3: Subsection A asks you to list income from your primary job. Include deductions for taxes withheld from wages and other expenses, subtract these from your gross income and list your net weekly wage. Connecticut Financial Affidavit JD-FM-6 Step 4: Subsection B asks you to detail all other sources of income. Connecticut Financial Affidavit JD-FM-6 Step 5: Section two, "Weekly expenses," asks you to detail all your expenses by category, including rent, utilities, real estate taxes, food and clothing costs, the cost of transportation, medical expenses, alimony payments, child support payments, day care costs and insurance expenses. List any expenses which are not detailed under "Other." Connecticut Financial Affidavit JD-FM-6 Step 6: Section three, "Liabilities (Debts)," asks you to list all your debts, including the amount and the creditor. Indicate the balance due and the size of all weekly payments. Connecticut Financial Affidavit JD-FM-6 Step 7: Section four, "Assets," requires you to list all property, motor vehicles, property, bank accounts, stocks, insurance, deferred compensation plans such as IRAs. Provide the total value of each and add them up where indicated. Connecticut Financial Affidavit JD-FM-6 Step 8: Under section five, "Health Insurance," list the name and address of your insurance provider if applicable, as well as all people covered by this policy. 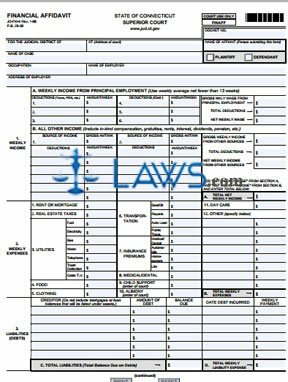 Connecticut Financial Affidavit JD-FM-6 Step 9: Restate your total income, expenses, assets and liabilities from each section at the bottom of page two. Connecticut Financial Affidavit JD-FM-6 Step 10: Sign and date the form before a notary public, court clerk or other Superior Court official.